In 2018 software development outsourcing is providing a vast variety of choices. Thousands of companies provide software development outsourcing services around the world. You will have a big choice depending on a lot of criteria such as geographical proximity, time difference, language requirements, and even cultural similarity. Existek is a custom software development company helping our customers to solve their business challenges with best in its class software. Contact us to get an instant and free expert consultation about your project. For all those years this type of service has shaped into the mature industry with a clear value offer. They are managing outsourced software development for businesses as well as ISVs. What is the state of software development outsourcing in 2018? 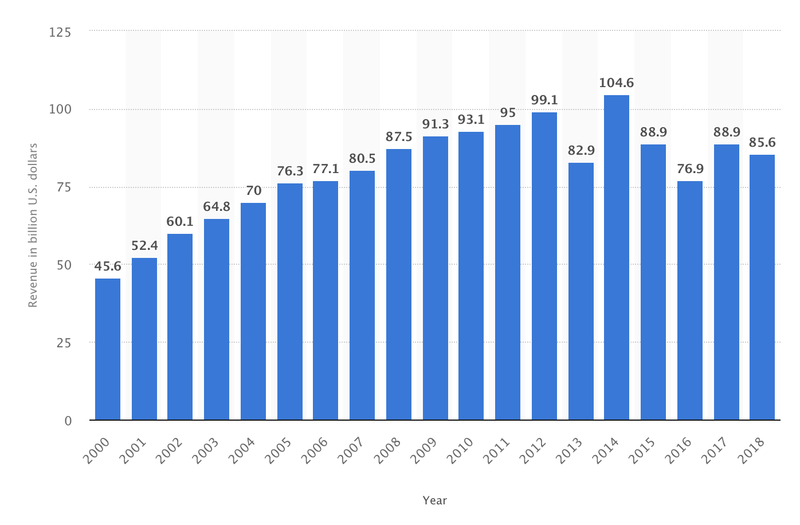 For the last 10–15 years, enterprises and software companies in developed countries are experiencing a growing demand for qualified software developers. A lot of developed countries lack a skilled workforce in technology and face the challenge of expensive services in their own country. For example, the Danish government expects that the country will lack 19 000 IT specialists by 2030. First of all, they are interested in talented and qualified specialists who are able to apply the rare technology expertise with met deadlines. Companies are looking for knowledge, creativity, and flexibility. That is something that outsourced software development teams can provide you with. Therefore, this trend gave the birth to the separate industry. It goes without saying that the advantages of outsourcing software development are rather vivid. Firstly, some companies can face the talent shortage on their local labor force market. They require new high-tech skills of their workforce so as to be always on the top. Secondly, there is some rare technology expertise that statistically cannot be found in the cities they’re physically located in. Modern technology can easily help with this issue. You will feel no difference working with the expert across the table or thousands of miles from you. Want to learn more about the dedicated teams and the advantages this model gives to software vendors? Read our article about the meaning of this model for ISVs business. Thirdly, outsourcing software development companies have accumulated the unique expertise of working with some industries and types of software products. Let’s imagine the situation — you need to develop a payment processing system — you are going to have the higher chances if you refer to the outsourcing software development companies who have already created such systems, instead of trying to assemble a new team in-house from the available developers on the local market. They might have no idea about the payment processing processes even if they’re good specialists in their technology like C++. As long as you use outsourced software product development services you will save your time and money. And of course the last advantage and probably the least — you can even cut down the services cost. Competition between outsourcing custom software development companies supported high-quality service and fair prices for it. There is no more question “why outsource software development” but you can come across “how to outsource software development”. Taking into consideration all mentioned details today we are going to discuss: what collaboration models you will be offered, what are the best countries for outsourcing software development, what questions to ask when outsourcing software development etc. As we promise we are going to investigate the question “how to outsource software development”. First of all, we are to analyze business enter software development outsourcing in different conditions and possible collaboration models. Sometimes companies do not have an internal IT department capable of the entire product development, their team is incapable of developing a particular part of the product, or they just don’t need to keep the in-house team constantly, so they are going to need outsourced software product development services for the one-time engagement. In this case, you can apply time and material and per-project based outsourcing contracts. So what do you need to expect from the software development outsourcing services? What suits your company better? How to make the choice? Time and material contract is used when you set the final goals and define all the requirements of the outlined tasks. It might also include planning, defining the milestones, handling the paperwork. The good news is that a lot of companies are willing to guide their clients. The price of this collaboration model is calculated in man-hour and depends on the cost of developers’ work dealing with the tasks. Providing that customer accepts the job with the warranty period, month or two usually, but any further cooperation or support will be the subject of another contract. 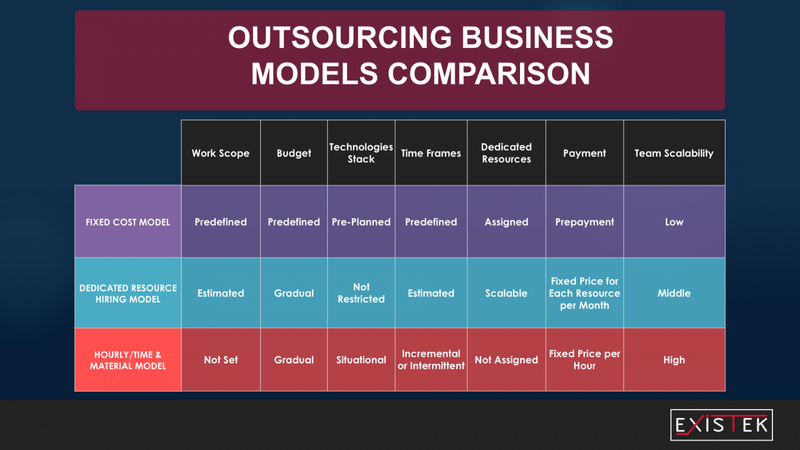 Per-project based outsourcing contract can also be called the fixed-price one. Due to this type of contract, its cost does not depend on how many hours and resources of the outsourcing company are spent to complete the project. Time and material contract can be used as the good preparation stage before the per-project based contract. It will save your time you might spend on planning. The project duration ideally should not exceed a half of a year period. Therefore, choosing those contracts, remember about being specific, setting all your requirements and providing detailed documentation. Another option, when companies need to augment their internal IT department with the outsourced software product development engineers, who are going to work alongside their in-house developers on the same tasks, cooperate with the internal team and augment it. In other words, they will function just as their own employees but located in a different country, which makes it easier to find, hire, and less expensive. If this is what you’re looking for, the dedicated development team service model will be a good choice for your company. Dedicated development team model is something similar to hiring new remote employees for your company. If you decide to try the dedicated development team model you or your employees such as the CTO or project managers will have the ability to lead the development directly. You can divide the development process into several stages. Basically doing the same thing as with your in-house staff. The dedicated offshore developers will help you to handle routine tasks as well as reaching the global goals. It is not only about actual developers. The team could include any specialist you need — designers, UX/ UI specialists, business analysts, project managers, quality assurance engineers etc. Their duties will cover launching, extending and supporting various types of software. Clients are fully engaged in the managing process, have the possibility of communication with every member of a dedicated team, or can have the responsible specialist to report to the client’s team. There are two available options of management. Projects can be managed onside (PM is chosen by the contractor) and offside (PM is assigned by the customer). As for the control of the expenses on the dedicated development team service and the billing models, you’ll have the following options: cost per resource, management fee, and the hourly rate. This model is efficient for long-term support and dedicated collaboration. There is no best or worst option for the clients, it is just your made decision based on your needs and requests. You can always consult the software development specialist for an advice to choose a suitable variant of the contract. As mentioned above, thousands of companies are providing software development outsourcing services. They are located in different parts of the world. But it is not a problem at all for the clients, otherwise, it is an advantage. You are able to choose the company using your own selection criteria. There are no more or less suitable countries for outsourcing, you just need to look for the ones that meet your own requirements. Usually, selection criteria cover geographical proximity, time difference, language requirements, qualification requirements, cultural similarity etc. These are the important features for a lot of companies while choosing the outsourcing software development services. Combination of all the available criteria will help you with implementing your tasks and reaching the goals. Below you will find a brief description of the most popular outsourcing destinations according to this aforementioned attributes. Our first option should be concentrated on the wide variety of companies in Eastern Europe. Ukraine, Belarus, Poland, Romania are the great countries for outsourcing that have a large number of high-quality developers which clients are able to choose from. These are relatively expensive regions with arguably the best possible quality of the services. The ideal option for clients from Western Europe because of the superior quality, cultural and geographical proximity and smallest possible time difference. Eastern European developers are known as ones of the most qualified IT experts and the number of them is increasing while Western Europe is handling IT talent and workforce shortage. Are you researching this region as a location for your next outsourcing project? Consider reading ourarticle about outsourcing industry in Eastern Europe and how to find a reliable company there. A great amount of talented IT specialists with high-quality education and convenient location are among factors that encourage IT outsourcing in Eastern Europe. In addition to this regular travels are quite cheap and fast and the legal disputes are easy to solve. But it is not only the best option for the companies from Europe, the US, and Canada who need rare technical expertise such as blockchain, AI, Ruby etc. also outsource software development here in order to receive the best possible quality of work at affordable prices. Asia and the Middle East is another outsourcing destination with a great number of companies located in India, Vietnam, Pakistan, Iran. This region is attractive for certain companies because of the cheapest price rates but at the same time, it is the riskiest one. The unstable political and economic situation in some countries causes the reasons that influence a lot of criteria. It is usually hard to solve any legal disputes. Some clients face the threat of the huge cultural barrier as well as the worst situation with the English language. Don’t forget about the geographical proximity, you will deal with the huge time difference, regular travels and communication are very tough to establish. Latin American outsourcing software development companies are the well-balanced option for the US-based companies. That goes without a question because of the geographical proximity and small time difference which is quite convenient. Service prices might be slightly lower than in Eastern Europe. However, the cultural difference and relatively low English level can be the issues. The day you are going to apply for software development outsourcing services, just remember about the best suitable selection criteria for your company that will make it prosper. 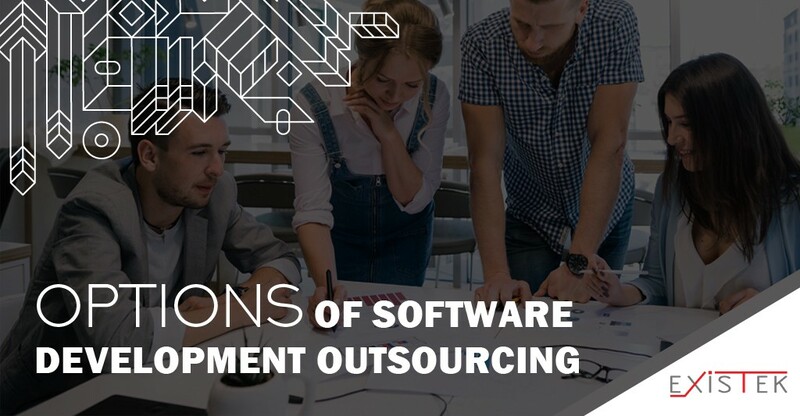 To make the conclusion, over the last 10–15 years software companies in developed countries are using the services of outsourcing software development companies. They are provided with high-quality and convenient services, affordable prices, skilled and high-educated staff. They have many options to choose for the collaboration. Your choice will start with geographical location, time difference, cultural similarity, language requirement, etc. But the most important criteria is the result and its ways of receiving. We hope that our article will help you to make the decision on the appropriate types of contracts in certain cases. You can always apply for time and material contract, per-project based outsourcing contract as well as a dedicated development team model. Making your choice still remember a few things: the project duration, your budget and the number of required developers. Read the original article about Software Development Outsourcing and share your thoughts on it. Anyway, all qualified outsourcing companies will be willing to hear your requirements first and then help you with your choice. The service is all about completed tasks and happy customers. You are always welcome to contact Existek for some piece of advice. You can fill in the form at a contact page, send us an email, or start the discussion in the chat widget on the right and we will be glad to provide you with the consultation to help you choose the outsourcing services model that will suit your specific business case. Full-cycle software development company. Latest company and industry news.